Got a minute? What about five? In the next 300 seconds you could be snoozing through your alarm, watching 1/12 of an episode of 60 Minutes, walking from your dorm room to class, waiting in line at the grocery store, wasting time on Facebook, crunching your way through 62.5% of an eight minute abs video, or helping the kid you babysit through five mad-minute math worksheets. Or, you could make this curried couscous. Five minutes and five ingredients—that’s all it takes. Couscous is the ultimate small kitchen college grain. Quick-cooking and requiring barely any kitchen skill, couscous is a blank slate for flavor. Curry powder, dried cranberries, toasted pine nuts, and lemon juice up the “wow” factor in this dish, without increasing the time needed or the difficulty factor. Bring 1 ½ cups of water to a boil. 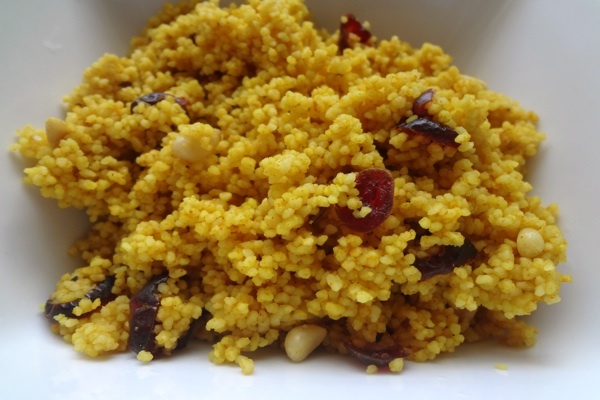 Combine couscous, cranberries, curry powder, and salt and pepper together in a large heatproof bowl. Pour enough boiling water over couscous until covered. Tightly seal bowl either with saran wrap, a plate, or a lid, and let stand until water is absorbed, five minutes. Meanwhile, toast pine nuts in a dry skillet over medium-low heat. Shake the skillet often to make sure the pine nuts are evenly browned. They will burn quickly, so keep your eyes open and your nose alert! The nuts are ready when fragrant and browned, about two minutes. Fluff couscous with a fork. Add lemon juice and toasted pine nuts. Stir until everything is evenly distributed. Serve hot or cold.